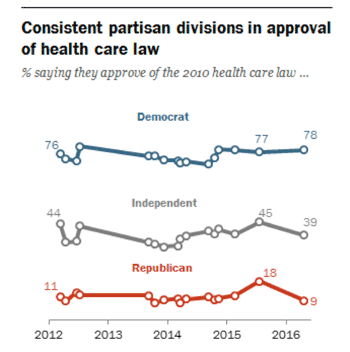 Obamacare came close to reaching a milestone mark of sorts last July: Public approval of the health care reform law as measured by the Pew Research Center nearly matched public disapproval. Since then, though, approval of the law has taken another tumble while disapproval has surged. According to a new Pew Research Center survey, 54 percent of Americans now disapprove of Obamacare, compared with 44 percent who favor it. While the approval rating has seen a modest four percent increase since the law’s passage in 2010, the disapproval rating has jumped 10 percent. 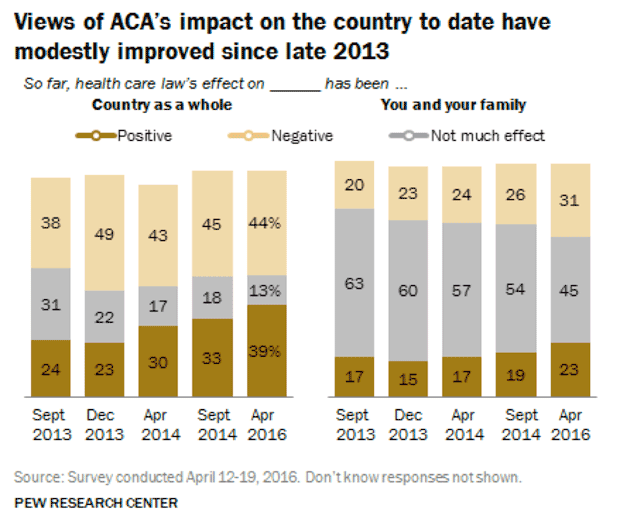 “However,” the Pew researchers added, “the balance of opinion about the law’s impact on the country has grown less negative over the past three years, even as slightly more continue to see the impact as negative than positive.” While fewer than four in ten people now say the law has had a positive effect on the country, that number is up from 23 percent in Dec. 2013. 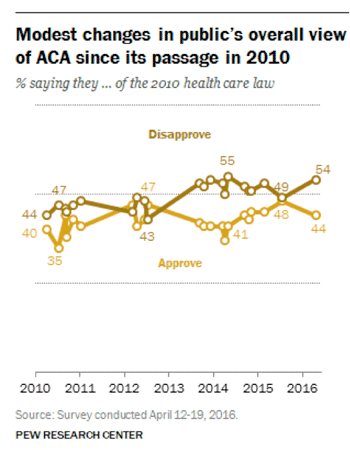 At the risk of reading too much into what are admittedly subtle shifts, it’s worth asking what turned the tide of opinion on Obamacare since last summer. The presidential race, in which conservative candidates have been slamming the law and promising once again to repeal it, is one obvious factor. Opinions on the health care law remain deeply divided along party lines. Only 9 percent of Republicans now approve of the law, plummeting from a high of 18 percent in July. The percentage of Democrats who approve of the law is now 78 percent, little changed over the past few years. Another possibility is that we’ve gone through another year of open enrollment, during which insurance shoppers saw new plans and their likely higher costs. And while Obamacare has helped extend coverage to nearly 20 million uninsured, health care costs remains a huge challenge for many families. Another newly released survey — this one from Gallup — found that those costs rank as the biggest financial concern for Americans, ahead of wages, debt and college expenses.